In January 2014, twenty museums and historic sites across the country launched the National Dialogues on Immigration Project: a bold, new public initiative to use historical perspective to foster dialogue on immigration issues among people with diverse perspectives and backgrounds through visceral encounters with the past. This cross-regional series is designed to spark a new national conversation on critical immigration themes of citizenship and american identity, restrictions and legality, borders and freedom of movement, and civil rights and civil liberties. 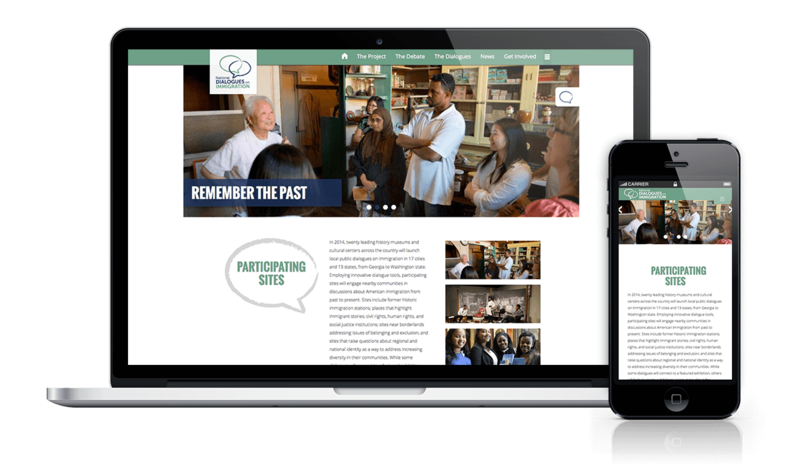 Dialogues needed a web presence that they could easily manage and provide resources regarding immigration and our rich history surrounding immigrants. Gorilla Web Studio built a custom WordPress website that integrated the Google Map API and a custom interactive immigration historical timeline.